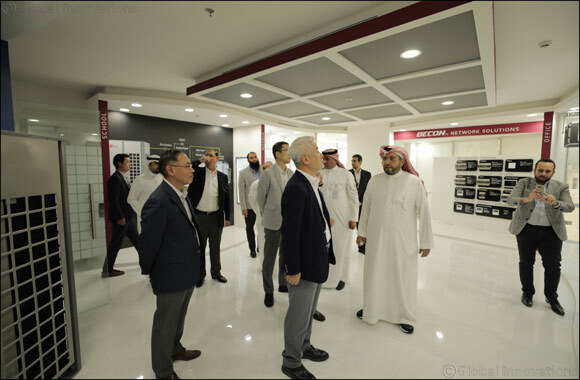 3rd October 2018: Shaker Group, the sole distributor for LG Air Conditioners in Saudi Arabia, has inaugurated the expansion and advancement of its integrated LG Air Conditioning Academy. The Academy, funded by LG Air Conditioners, was announced at Shaker's premises in Riyadh and attended by LG & Shaker top management and representatives. 'The launch of the Academy establishes the parallel strategic directions of Shaker & LG as they endeavor to provide the best Product Knowledge and education about advanced technologies in LG Air Conditioning products. The training sessions are designed to support our business partners in maintaining their best practice standards. Over the years, LG and Shaker Group have dedicated their efforts to improving the quality of life for all customers by delivering ground-breaking, Energy Efficiency Solutions '. The Academy has been implemented to ensure that the best practical training support and skills are being provided to young Saudi professionals in the market. The Academy covers a diverse range of topics, ranging from LG Multi V™ (VRF) system selection, installation practices and comprehensive servicing for all products. The innovative new platform, delivered using the unique experiences of the Academy’s professional staff, encompasses ‘Application Showroom’, ‘Lecture Room’, and industry-leading practical ‘Training Room’ facilities, which incorporate the latest technological advancements in the market. 'The demand for best practice installation training has increased due to significant technological advancements in the Air Conditioning market. LG is proud to sponsor and collaborate with Shaker Group in launching the LG-Shaker Air Conditioning Academy here in Saudi Arabia,” explains Mr. Kevin Cha, LG Regional Head Quarter President. 'We have a deeply rooted commitment to provide our workers with high-level training to mirror the best practices for the industry at a state-of-the-art facility'. Trainees will gain valuable first-hand experience in the implementation processes of the products' installation, operation, and centralized network solution under the guidance of professional experts. The ‘Application Showroom’, however, has also been equipped to illustrate the different applications of LG Multi V™ products across a variety of targeted HVAC sectors. The Academy recognizes that separate zones reflect the Multi V™ implementation across Residential, Hotel, Schools, and Office applications. The Academy project is part of the Shaker and LG development plans for the Saudi market, with the overall aim to enhance the depth and breadth of HVAC solutions. Through expanding sector growth, Shaker and LG strive to improve the capabilities of young Saudi professionals and educate them on the availability of Energy Efficiency Solutions in line with the Saudi Vision 2030.